Gryphon Games is a publisher of unique fast, fun, family board games that appeal to a wide array of players of all ages. Created to appeal to game players looking for light-to-medium-weight strategy games, Gryphon Games are fun to play within families, with friends, in the classroom and at libraries. They have short and simple rulebooks (readable and explainable in 5 minutes or less) and are typically playable in 20 to 40 minutes. The artwork and production values are high and the game play is snappy and innovative. The themes and settings are fun, interesting and educational. That is why Gryphon Games lend themselves so well to families, social gatherings, game groups, libraries, classrooms, and all manner of environments where fun and learning go hand-in-hand. Gryphon Games is publishing some of the hottest new designer games in the marketplace today. Designer games (sometimes called “Euro” games) are different from more widely recognizable mass-marketed games, like Monopoly. They tend to require more strategic thinking, often have a theme that sets them in a particular historical or event context, have high-quality art and components and rely less on luck than on the players' evolving skill at mastering the game. Gryphon Games are a fun, effective and engaging way to learn everything from facts to figures, from concepts to philosophies. Our games make learning come alive as players compete, cooperate, learn from experience and develop strategies to meet their changing circumstances, all within a dynamic social environment. 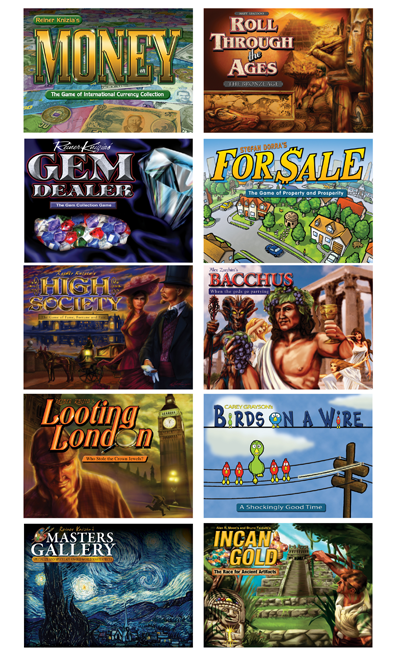 Some titles in the Gryphon line include the collectible, numbered Bookshelf Series that has become the talk of the gaming community – Money, Roll Through the Ages, Gem Dealer, For Sale, High Society, Incan Gold, Looting London, Birds on a Wire and Masters Gallery. In addition, Take it Easy is a colorful Bingo-like game that has sold over half a million copies worldwide and is perfect for game groups, classrooms, and gatherings of any size or kind. "Stoplights", a simple strategic card game for 1-3 players (ages 4 and up) and "Take it Easy" have both just won Scholastic's Instructor Magazine's 2009 Teachers' Pick Award. Arthur Saves the Planet has won numerous awards, including the Parent's Choice award, and is endorsed by PBS. Choose Gryphon Games for the best in family board games.